You are currently browsing the Collector Model blog archives for January, 2014. MPC(R) is giving away 100 Autographed Prints! To commemorate the return of the Space 1999 Eagle 1 (MPC791) in 1:72 scale and the Space:1999 The Alien (MPC 795) in 1:25 scale MPC (R) is randomly inserting 100 autographed mini prints into these model kits. Space: 1999 which originally aired in 1975, featured the crew of the Moon Base Alpha as they found themselves stranded on the moon when a nuclear disaster knocked it from the Earth’s orbit. 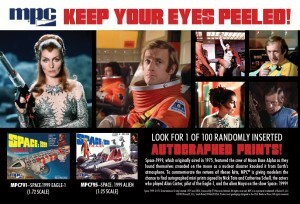 Modelers have the chance to find 1 of 100 mini prints signed by Nick Tate (Alan Carter, pilot of the Eagle-1) or Catherine Schell (the alien Maya) in boxes that showcase the contributions of these two actors made to the show. Recently I have had some inquiries about resin. I do not have a lot of experience with resin as a medium so I asked one of our advanced designers for some feedback. His response is as follows. As a material, resin is not as forgiving as plastic. It is more brittle, and if made solid, the end model is much heavier than a plastic one. Most modelers’ experience with resin kits are building “garage kits”, which means a guy or group making an unlicensed kit of their own in their basement or garage and selling them to whoever is interested. By the nature of that market, quality is very spotty. A lot of the product being sold at a show like Wonderfest is this kind of stuff. A lot of what you see in Amazing Figure Modeler is this kind of product. If we or Moebius didn’t make a kit you see in there, somebody made it themselves and they are selling them. Yes, resin kits are much more expensive, but we are trying to find sources that will make them for a reasonable price and with more consistent quality than those found in the aftermarket. Garage kits usually go for no less than $125 and could be anywhere above that. Take a look at the product review pages of AFM. Why are we doing kits in resin rather than styrene? Our public answer is that we want these to be super detailed kits. Because of the injection molding process, detailed textures get minimized on the sides of plastic parts. They almost always have to be smooth to keep the part form being trapped in the tool. It would be easier to show you an example than to explain it in writing. Anyway, with kits like Kane or King Kong, a lot of the great detail would get compromised. What are your thoughts on resin as a medium?